The origins of this unconventionally shaped chamber pot bear connection to the figure of the renowned French preacher, Jesuit Louis Bourdaloue (1632–1704). In the second half of the 17th century, Bourdaloue was recognised as one of the greatest orators who delivered sermons also at the court of Louis XIV de Bourbon (1638–1715, King of France 1643–1715) in Versailles. They were said to be extremely interesting, but also very long, which confronted the audience with problems of physiological nature. In order to avoid skipping the sermons, ladies began to bring sauce boats which allowed them to ease themselves unnoticed without going out of the chapel. The idea gained popularity and faience manufacturers soon launched production of small women’s chamber pots – pot de chambre ovale, also known as bourdaloue. They differed from sauce boats in their edge folded inside with no spout and the lack of base. Owing to their properly designed shape, which guaranteed discreet use, chamber pots proved extremely useful and convenient during lengthy journeys, which is why they are also known as coach-pots in England. In the 18th century, they gained popularity all across Europe, including Warsaw. The faience oval chamber pot was found during archaeological excavations on the site of today’s Marshal Józef Piłsudski Square. They were undertaken in 2006 in connection with the project of rebuilding the Saski Palace, destroyed during World War II. The works revealed exceptionally well preserved remnants of historic walls – the foundations of the older 17th-century Morsztyn Palace and the later Saski Palace. A considerable collection of objects was excavated from the backfill of the palaces’ basements as well as 18th-century pit latrines and rubbish dumps. These objects reveal what can sometimes be very intimate details of the daily life of the palaces’ residents. One of them is this women’s chamber pot, adorned with a popular floral motif underglaze painted with cobalt on the white background, with a broad border around the edge of the rim. 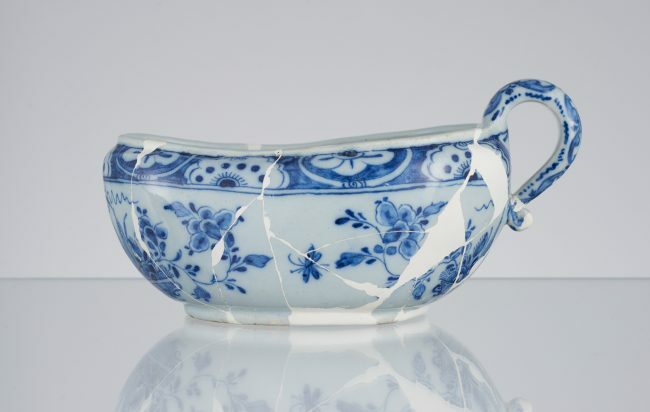 Although the bottom of the chamber pot with the manufacturer’s mark has not been preserved, it can be assumed that it was produced in Delft at the beginning of the 18th century. Towards the end of the same century, it was discarded at a rubbish dump in the courtyard of the southern wing of the Saski Palace. In all likelihood, until then it had been used according to its function by one of the ladies who resided in the Palace.